Ace Cycle Blogger, and pioneer of Copenhagen Cycle Chic, Zakkaliciousness has just started up a new blog – The Slow Bicycle Movement. 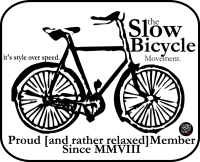 Expounding on all things great about cycling slowly, SBM will surely follow in the footsteps of Zakk’s other great blogs, and hopefully win over a few more people to the cause! Intrepid Commuter is proud to be a member.